Apple recently released a new iOS version for use on iPads and iPhones, iOS 11. You may experience difficulty connecting to Middlebury College email hosted by Microsoft when using the native iOS Mail and Calendar Apps. ITS recommends you use Outlook for iOS available free in the App Store. Apple and Microsoft are working on a solution. UPDATE: this issue was resolved with iOS 11.0.1. Apple also announced the next version of macOS, High Sierra, available 9/25/17. ITS has instituted a block on the installation of this OS on college managed computers until it can be tested with college systems and software. Our High Sierra webpage (http://go.middlebury.edu/highsierra) will provide updates as they become available, including notes about any known issues and resolutions. This entry was posted in Middlebury Community Interest, Post for MiddNotes, Post for MiddPoints and tagged Apple, Helpdesk Alert, Mac, operating systems on September 22, 2017 by Cynthia Slater. Mac OS X Yosemite (10.10.x), released on 16 October 2014 and is available as an upgrade for faculty and staff who are currently running Mavericks (10.9.x). If your machine is running Mavericks (10.9.x) or Mountain Lion (10.8.x) the upgrade will appear automatically in Software Updates under the Apple Menu. If your machine is running Snow Leopard (10.6.x) or Lion (10.7.x), you will need to contact the Technology HelpDesk to discuss upgrade options. As with all operating system upgrades, there are potential issues of compatibility with applications and services and we are currently neither promoting nor discouraging the upgrade. New computers provided for faculty and staff will continue to have 10.9.5 (Mavericks) installed for now; public labs are not scheduled to be updated to Yosemite at this time. Knowing that there will be “early adopters” who opt to upgrade right away, we have created a site to share known issues and areas of concern. Visit go/yosemite/ to view — or add to — this work-in-progress. Yosemite has several improvements, including better support of multiple monitors, handoff capabilities between Yosemite and iOS8 devices, and enhanced iCloud Drive capabilities. See Apple’s complete list of what’s new in Yosemite or take a personal tour using lynda.com’s new, hour-long course, Mac OS X Yosemite New Features. This entry was posted in libitsblog, LIS Staff Interest, Middlebury Community Interest, Post for MiddPoints and tagged Mac on October 22, 2014 by Cynthia Slater. 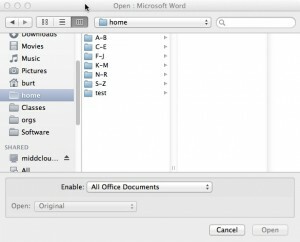 Mac users… Are you having the best possible experience with Middfiles? It may be time to update how you connect to Middfiles, as well as create some useful shortcuts! First, check your connection. In the Finder, click on the Go menu, then click Connect to Server. 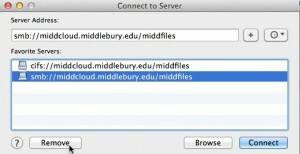 You should use cifs://middcloud.middlebury.edu/middfiles and remove any “smb” middfiles favorites you may have stored, as shown. Now it’s time to create some powerful Sidebar favorites for easy access to your frequently-used folders (see sample below). Sidebar favorite locations are visible in all your programs! Refer to our wiki article for complete details on how to create these favorites & get rid of outdated ones. Technical stuff: We use the SMB protocol to connect to Middfiles almost exclusively on campus and the latest revision is CIFS. To use the most current version of SMB you must specify CIFS in your connection. Outdated connections may results in errors when saving to Middfiles or be slower. This entry was posted in LIS Staff Interest, Middlebury Community Interest, Post for MiddNotes, Post for MiddPoints and tagged Mac, middfiles, servers on May 16, 2014 by Cynthia Slater.